This wonderful app for children was developed to educate and entertain youngsters and the young at heart. 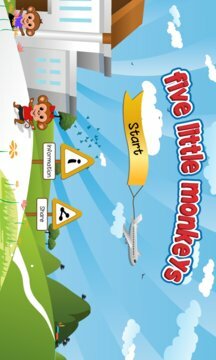 The familiar nursery rhyme accompanied by lively music, specially created for this app, will appeal to a wide audience. 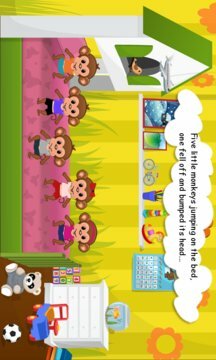 Math skills are built as the child helps remove one monkey from the scene as the story develops. Counting down from five to one and early word recognition are part of this engaging app.The interactive elements on each page provide endless fun – toys around the room move and make sounds with a touch, the water faucet turns on, the ketchup spurts and the blinds open and close. These and other interactive elements help children learn concepts such as on and off, stop and go, and help them identify the types of sounds that various animals and objects make. With an original musical score and a young voice singing the tune, children will love to listen to this repeatedly.